The much anticipated 2010 Geoffrey Beene Gives Back Rock Stars of Science (Rock SOS) Campaign was launched in the December 2010 issue of GQ. The project is part of Geoffrey Beene's philanthropic business model that has provided $145 million to a long list of nonprofit organizations. Given Geoffrey Beene's keen interest in finding a cure for cancer and other diseases, The 2010 campaign features 17 leading researchers from fields ranging from Alzheimer's and cardiology to autism and cancer. 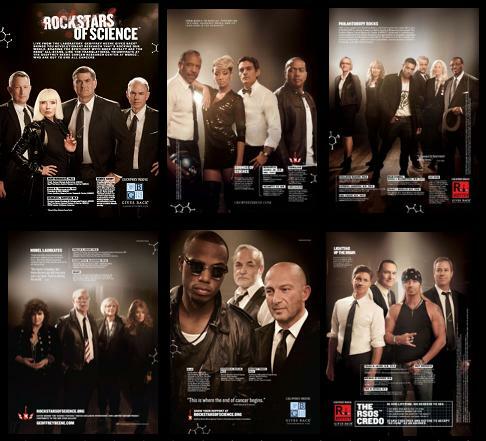 What sets the Rock SOS campaign apart from other efforts to raise awareness on issues is that it partners these leading researchers with literal rock stars from the music world. The music side of the 2010 campaign features Debbie Harry, Bret Michaels, Timbaland, Jay Sean, Keri Hilson, B.o.B and Ann and Nancy Wilson of Heart.